We extend our many thanks to our gracious host organization, Pilots for Patients, for their warm hospitality in bringing us AIR CARE 2012. The delegates from many Public Benefit Flying Groups enjoyed wonderful presentations, wonderful social events in New Orleans, delicious meals, and a great conference. Thank you to our hosts from Pilots for Patients, all the delegates, their groups, and the presenters for making Air Care 2012 so memorable and valuable! This page is available as a PDF document HERE! Each year the Air Care Alliance holds its national AIR CARE conference to bring together leaders, staff, and supporters of public benefit flying. Attendees enjoy sharing knowledge and building relationships with their colleagues and industry professionals from across the country. The ACA is pleased to invite you to the 2012 AIR CARE conference, which will be held in New Orleans, Louisiana at Hilton New Orleans Riverside Hotel on Friday & Saturday, April 13th & 14th 2012. Many thanks to our gracious host organization, Pilots for Patients, for bringing us Air Care 2012 in “The Big Easy.” This bulletin will provide you an overview of the conference plus the hotel and event registration information for the Air Care Alliance annual public benefit flying national conference. AIR CARE 2012 - REGISTER NOW! DO NOT HESITATE TO BOOK YOUR HOTEL ROOMS! Our hotel block is filling up fast as are rooms in other hotels. What: Friday evening (6-8 PM) Cocktail reception and meet & greet. Why: To benefit from the goodwill and mutual support gained from working together and learning from one another (and to have fun doing it)! And to learn from nonprofit and industry leaders about topics impacting or supporting non-profits in general and public benefit flying organizations in particular. How: You will find all conference and hotel registration information on the following pages. It is a simple two-step process. Just call or click the Hilton New Orleans Riverside Hotel in New Orleans to reserve your room by March 13, 2012, then complete and return the Air Care conference registration form with payment by April 1st, 2012. See the registration information below. For last minute information visit the Air Care 2012 conference page at www.aircareall.org. Also: Air Care is a time to share! This is an opportunity for your group to show other attendees how you work. Thus we are requesting those who wish to send ahead or bring along the following information in order to facilitate more meaningful and productive sessions. Even if no one from your organization will be able to attend the conference we encourage you to send your group’s information ahead. · Bring something to share, either a success story or any other thing you would like to ‘show & tell’ during the Saturday AM introduction session. If you wish to hand-out items to conference attendees during your session, please bring 60 copies for distribution. Your taste buds are in for a treat! Tommy Cvitanovich, President of the Louisiana Restaurant Association, will be cooking his famous charbroiled oysters just for our group! We will be going to Ernst Café, across the street from the Hilton, where Tommy will cook for us and we will have our meet and greet. Miss Louisiana, Hope Anderson, will also be available for photos. You can stay afterwards and continue to dine on your own at Ernst Café or visit one of the many other fine restaurants and enjoy wonderful music events all over the French Quarter. See below for additional information about the festivities! Daytime Meals: During the morning registration and informal gathering we will provide a Continental Breakfast, and at noon a selection of Deli sandwiches and beverages. This is included in the conference registration fee. Hope Anderson, Miss Louisiana, has chosen Pilots for Patients as her campaign platform topic and will speak on the importance of volunteer flying. Mike Walsworth, Louisiana State Senator will be sharing what we in Louisiana have learned from Hurricanes Katrina and Gustav and how we are preparing for the future. Phil Jones, Asst. Secretary of Louisiana DOT and Brad Brandt, Deputy Director of Louisiana Dept. of Aviation, will discuss how to utilize resources from groups like Pilots for Patients and ACA in times of crises. Larry Lehmann, New Orleans Tax Attorney and Volunteer Pilot, will tell us what a volunteer pilot needs to know about US Income Tax laws, regulations, and tax related opportunities and challenges of charitable flying. Jeff will provide an update on the status of laws and regulations, including a discussion of the newly passed legislation requiring the FAA to provide for fuel reimbursements for volunteer pilots providing charitable medical support flights and how that may relate to prior FAA fuel reimbursement exemptions provided to some groups. Benét Wilson, Director of Media Relations, Aircraft Owners and Pilots Association (AOPA), will discuss the importance of telling our stories to the public by developing good relationships with the media. She will describe the media’s needs and limitations, and will brief us on the opportunities for developing a media campaign for your group and its volunteers by taking advantage of AOPA’s recent special campaign, working with their media relations firm. The panelists will provide their experiences in managing the impact of the economy on their organizations through increased fundraising efforts, tighter financial controls, and other measures, and will encouragement participation by attendees. Lindy Kirkland, President, Air Care Alliance, will provide us a look at the form and content of the actual course, which resulted from ACA’s work with its members, the NTSB, and AOPA in the aftermath of several accidents involving public benefit flying. This short meeting will include some important updates, including procedures for submitting nominees for the annual Public Benefit Flying Awards presented in the U.S. Capitol Building in Washington DC, plus our annual elections of Directors and other business. Stage Door Canteen @ the National World War II Museum: you will enjoy a spectacular and special dinner in the museum by Chef John Besh and the American Sector restaurant and will see the new production created especially for the Stage Door Canteen: On the Air! 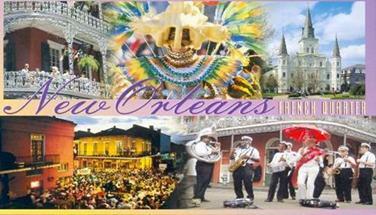 April 12th through the 15th is going to be a fabulous time to be in New Orleans. Not only will we be there, but also the French Quarter Festival is on that weekend. Go to www.fqfi.org to learn more about this celebration of historic New Orleans. In 2011, there were more than 200 performers on 20 stages and more than 90 food and beverage booths throughout the French Quarter. If you have never been to New Orleans, this will be a great time for you to see why it is such a popular tourist destination! A cab ride costs $33.00 from the airport to the Central Business District (CBD) for one or two persons and $14.00 (per passenger) for three or more passengers. Pick-up is on the lower level, outside the baggage claim area. There may be an additional charge for extra baggage. Taxis are required to offer a credit card payment option. Of course shared shuttles and rental cars are also available. 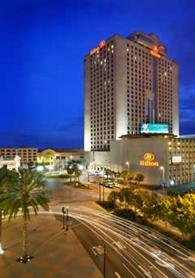 Experience the best the Crescent City has to offer from the beautiful Hilton New Orleans Riverside. Located on the banks of the Mississippi, your full–service New Orleans French Quarter hotel is adjacent to the Convention Center, Riverwalk Marketplace, and countless attractions and restaurants. Settle into sumptuous accommodations, and explore this “city within itself.” Enjoy the expansive health club. Dine within legendary restaurants. Few French Quarter New Orleans hotels offer so much luxury in such a prime location. NOTE: the conference hotel is full! There are other hotels with rooms nearby and in nearby communities. Because of the area festival they are filling up fast. Please run a search and book your rooms now. Some hotels with rooms as of March 20 are: the Four Points Sheraton located in Metairie 3 miles from the New Orleans airport and 9 miles from the French Quarter. www.starwoodhotels.com; The Wyndham, the Holiday Inn French Quarter, and the Royal St. Charles near the Hilton. Most of the more affordable hotels seem to be out near the airport.